GREENWOOD VILLAGE, Colo., Feb. 24, 2018 /PRNewswire/ -- Red Robin Gourmet Burger & Brews (Red Robin) crowned a new Best of the Bash Award champion at the Heineken Light Burger Bash presented by Schweid & Sons hosted by Guy Fieri. Burger master Jorgie Ramos'Latin Burger took home top honors in Red Robin's annual competition at the prestigious Food Network & Cooking Channel South Beach Wine & Food Festival event. As part of the prize package, Ramos was presented with a check for $10,000 and the chance for his award-winning creation to appear on Red Robin's menu in the future. "From the first bite of the Latin Burger we knew we had something special in our hands," said Dana Benfield, senior vice president and chief marketing officer at Red Robin. "Every burger we tasted here at the Burger Bash was packed with incredible flavor, but the Latin Burger is truly a Red Robin-worthy build that our guests would love to see on the menu." 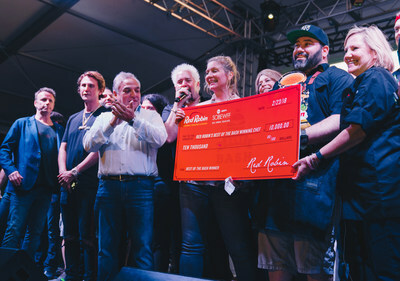 All chefs participating in the Heineken Light Burger Bash were invited to enter their burgers into Red Robin's Best of the Bash Award competition. Entrants were judged by a distinguished panel of judges including celebrity chef Amanda Freitag, past Best of the Bash Award winner Michell Sanchez and members of Red Robin's executive team. "With so many delicious burgers in front of us, it was tough to narrow it down to one winner," said Amanda Freitag. "At the end of the day, it was the mouth-watering combination of Cantimpalo chorizo, sweet plantain marmalade, manchego cheese and chimi aioli on the Latin Burger that we felt was most deserving of Red Robin's Best of the Bash Award." In addition to the Best of the Bash, Red Robin showcased its commitment to a burgers and brews culture by serving the winning burger from its Golden Robin Awards, which features burgers created by talented Florida International University students, at the Heineken Light Burger Bash. Angelic Cox, the recipient of this year's honor, was on hand to treat attendees to her Jerk Man Burger featuring an enticing combination of sweet and spicy Caribbean flavors. The juicy, all-beef patty is flavored with Jamaican seasonings, a dollop of Jerk BBQ sauce and is topped with fresh mango salsa and Muenster cheese to deliver the taste of the islands in every bite. For more information about Red Robin Gourmet Burgers and Brews or to find the nearest restaurant, visit www.redrobin.com.